Watch the interview and live performance, and read the article here! Sonyk Vortex talks about their work with NM Dogs and Kids Supporting Kids, with guest rapper Ricky Nelson. 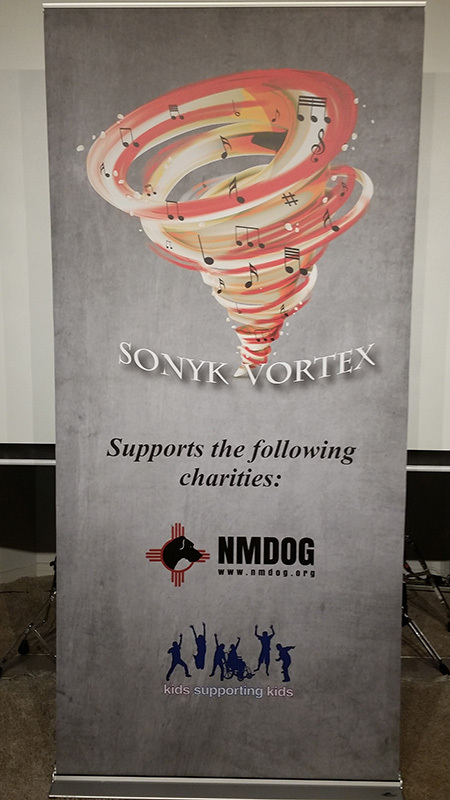 Sonyk Vortex supports two charities: NMDOG and Kids Supporting Kids New Mexico. Since forming in Fall 2012 the band has played at numerous venues to raise money for their charities, including playing at an Albuquerque Isotopes baseball game, Summerfest, the New Mexico State Fair, Cliff's Amusement Park, numerous birthday parties for children and for adults, schools, fundraisers and holiday events. NMDOG is an all-volunteer, 501 (c) 3 dog rescue unlike any other. Established in 2011, NMDOG reaches out across the state of New Mexico to the dogs that need help the most: the chained, the abandoned, the victims of the most horrific cases of cruelty, the forgotten ones. We are their voice… sometimes their only voice! We focus our efforts on rescue, community outreach, education, rehabilitation, adoption, and networking. We work to free chained dogs from their tethered misery, to see them living inside of a warm and loving home, and attempt to accomplish this by educating their guardians to do better for their canine family members. We offer guardians any supplies that will help them accomplish this goal, whether it be fencing, doghouses, food, obedience training, spay/neuter, or other medical services. When guardians choose to owner-surrender their animal instead, we take these pups into our program, or arrange for another reputable private rescue to take them in. This is when the, often lengthy, process of healing and rehabilitation starts. And this is where our wonderful foster families come in. We have no shelter facility, and our foster homes allow our dogs to heal in the safe, loving environment of a real home (often the first one they’ve ever known) until they are whole again, and ready for forever. We are proud of the many fruitful partnerships we have established with other private rescue organizations, local animal control/welfare departments, law enforcement, and municipal shelters. We are always available to talk to municipal leaders and other groups about the importance of spay/neuter, about the dangers of chaining, and about developing more humane animal welfare standards. We are especially proud of our partnership with the Bernalillo County Sheriff’s Department and the Bernalillo County Animal Cruelty Task Force. When a pediatric patient is fighting through illness or injury, there can be a pain and sickness component that is not always addressed by conventional medical care. That's where the UNM Center for Life and integrative medicine come in. Through acupuncture, massage, and other complementary and alternative medicines, providers are able to support the whole person in their healing process. Unfortunately, not all integrative services are covered by the patient’s insurance benefits and that is why Kids Supporting Kids New Mexico was created. Funds raised for Kids Supporting Kids provide therapies that are typically not covered by insurance. As a result, integrative medical services are provided for children fighting cancer, blood disorders, and other life-threatening ailments that families normally cannot afford.